It’s still a pretty slow blog week and reading week, too. No slumps, I hope, just terribly slow reading because I always find something else to do whenever I find some free time. Next week seems to be a very exciting week in the book world (hee, Thursday Next reference!) since it’s time for Book Expo America, and about half of the bloggers I follow are going there. Unfortunately, I’m all the way on the other side of the world, so I can only “watch” people squee for the entire event and all. Don’t worry, one day, I’ll be there, too. The Piper’s Son by Melina Marchetta (Book Depository). Okay let me squee! I wasn’t expecting this to arrive until next week, so seeing this package really excited me! I cannot wait to read this. Now, I should probably read the two other books in the Chaos Walking trilogy soon. Hee. What Happened to Goodbye by Sarah Dessen ﻿(Amazon Kindle store). Apparently, the print copy of this book won’t be here until June, so an ebook sufficed for now. I don’t mind buying a print copy since it is Sarah Dessen anyway. I’ve finished this book last week, but I’m kind of having a hard time writing a review. Love Story by Jennifer Echols(Simon and Schuster Galley Grab). I wouldn’t have seen this if Kai hadn’t tweeted about it. It was hidden in the adult e-galleys in the Galley grab newsletter, so easy to miss. :) I have no idea when I’ll be able to read this, though. See, pretty squee-worthy, right? I’ll be reserving some of these books for possible slump days — nothing like an awesome book to snap you out of a slump. oh gosh! i’m so envious right now! 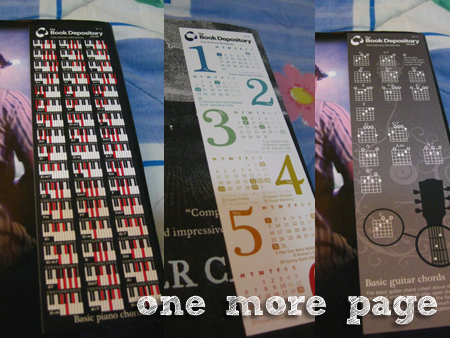 i hope i could still get divergent in hard cover at fully booked! Tina, have you spotted Divergent in HB only? Thinking of getting a copy here, meron na kasi paperback. If meron PB sa Manila, it might be cheaper to buy there nalang. Hi Yam! Fully Booked has both hardbound and paperback. Paperback is P432, but I remember it’s cheaper in NBS. The price of the paperback copy here after conversion comes out to Php613. Sayang din yung approx Php180 difference. I’ll buy my copy in Manila. A Monster Calls? Sweet. I’m so glad you got it before the price at BD went up. It’s kinds of pricey now. I really need to get on reading The Piper’s Son. I’ll be posting an IMM as soon as I have chance, so you’ll have to come over. Divergent and Piper’s son! I need them! 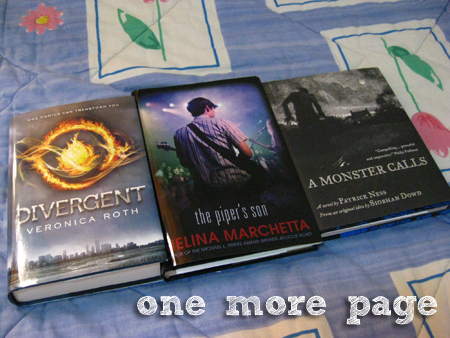 I think I should start persuading my mother to buy those books in BD. Is the bookmarks free from Book D? Hi Tin! It’s a different book from the Chaos Walking series, something he was asked to write because the original author, Siobhan Dowd, passed away before this book was finished. It looks awesome. I can’t wait to read A Monster Calls! This book has so much buzz right now! Yes! And it’s just so pretty, in a dark, Patrick Ness way. Hee. Thanks for visiting! Oh, so that’s why. I guess I’m lucky I got them in two separate packages? :) Awesome. Now I want to order more. Hm. Yeah, Divergent’s cover is so fiery. :D Thanks for visiting! You are my new favorite person b/c now I have Love Story!! I am so excited to read it! I got Divergent a few weeks ago, but haven’t been able to start it. I keep hearing great things about it! Enjoy all of your new books! I know *everyone* is going to tell you this but Divergent is FANTASTIC. (Yes, it deserves all CAPS). It’s on eo fmy favourite reads of this year. I think you’re going to love it! I just ordered Divergent and hope it’s good. Congrats on your great books c: Happy reading! Yeah, I’m so excited to read them all. :) Thanks for visiting! Oooh, A Monster Calls, I loved The Chaos Walking trilogy so I might have to get that book too. I hope I get some cool bookmarks with all the books I just ordered from Book Depository! Divergent easily rivals The Hunger Games, maybe even surpasses it. I hope you like it as much as I did! HOLY CRAP, TINA. Lookit your mailbox! LOOKITLOOKITLOOKIT. It is filled with so many fabulous books! That I want to read too! 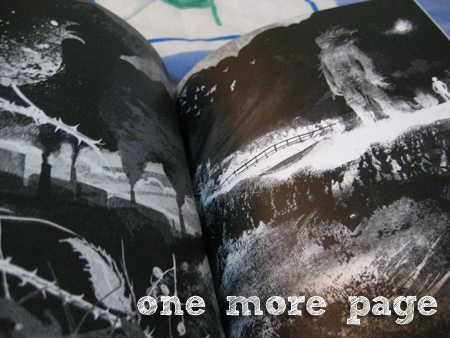 I mostly want to ogle those illustrations from A Monster Calls. They look hauntingly gorgeous.